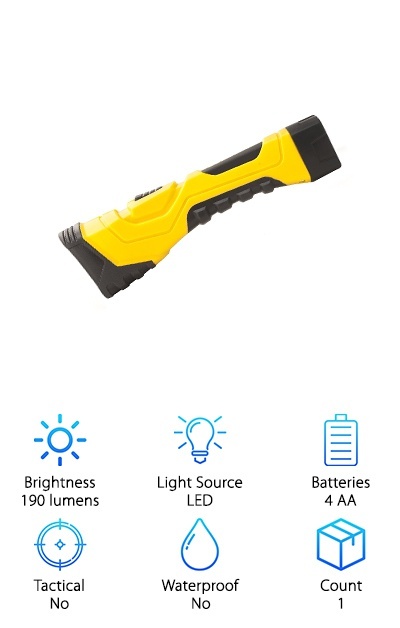 Whether you’re hiking, camping, working as a police officer or EMT, or just stuck at home when the power’s out, the best AA flashlight can really make a difference. There’s actually a lot more to these flashlights than meets the eye. We’ve researched some of the newest and best-selling products to help you find the best AA flashlight. But before we get to our AA flashlight reviews, here’s some of the features you need to know about when shopping for an AA flashlight. Brightness - Brightness is measured in lumens. A lumen is how much light is emitted by a source. The flashlights we reviewed range from 130 - 1075 lumens at their brightest, though they all have various settings that are significantly dimmer. 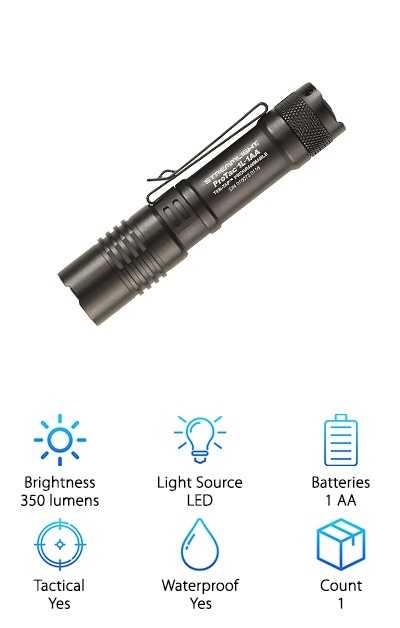 Lightsource - All of the products in our AA flashlight reviews use versions of LED lights. LED stands for light-emitting diode and they’re typically paired with a reflector and a cover or lens when they’re used in flashlights. Batteries - All of these flashlights use AA batteries. Obviously. Where they differ is in how many AA batteries they use. This varies from 1 all the way up to 9. Generally, the more it uses, the brighter and more powerful the flashlight is. Tactical - A tactical flashlight is one that can be used with a firearm to help get more accurate aim in low light. They tend to be small and lightweight and they’re perfect for everyday use because they’re also powerful. Waterproof - For our reviews, we rated something waterproof if it could actually be submersed for a short period of time. Some of the others are water resistant, though, and will be all right in rain and some splashes. Count - While some of our top products come as one unit, there are some that come in packs of 5. Multipacks are perfect for gifts or just to make sure you always have one ready when you need it. 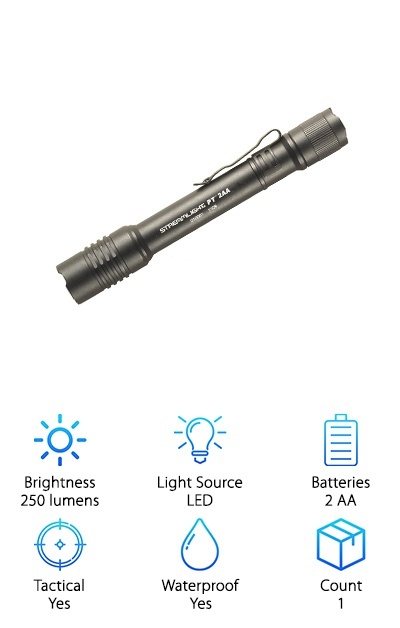 Whether you’re an outdoorsman, a police officer, or if you just want to be prepared in case the power goes out in your home, having the right AA flashlight is essential. 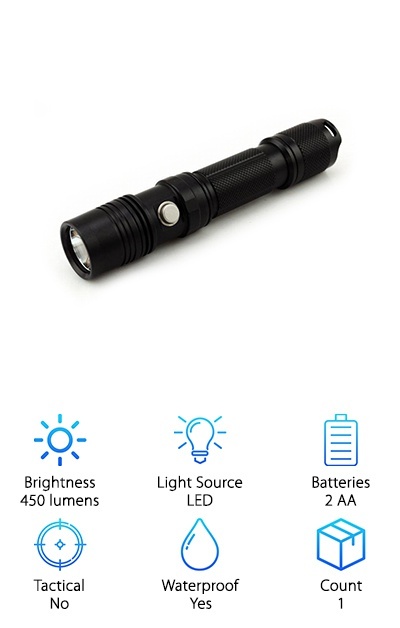 Now that you know what features to look for when shopping around for best AA LED flashlight, let’s jump right into our reviews. If you’re in a hurry, make sure you check out our top and budget picks first. Okay, let’s get right to it! If you’re looking for the best single AA flashlight that you can carry around every day, the Streamlight 88016 ProTac is one you should definitely check out. You might be wondering, what makes it the best AA flashlight? For starter, it’s small - only 4.25 inches long. Plus, it’s made out of lightweight, durable aluminum so it weighs only 2.5 ounces (with included battery). It uses either one AA lithium or alkaline battery. And get this: batteries are included. In fact, when you used the included CR123A battery, it shines as brightly as 350 lumens with a 1.5 hour run time. It comes with a reversible pocket clip and can also be used to attach it to a hat or visor for hands-free use. You get a high, low, and strobe setting just in case of emergencies. 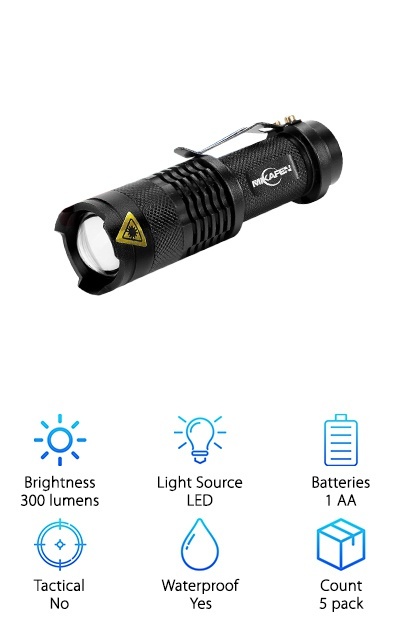 This might be a small flashlight but it’s mighty powerful! What do we mean by that? 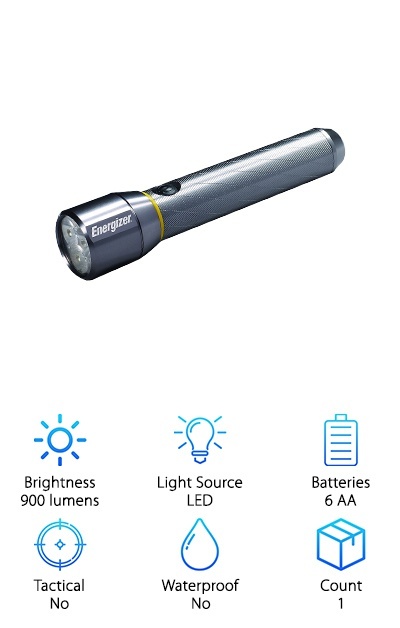 With AA battery, you can get an intense 300 lumens beam of light up to 600 feet away! That’s not all. 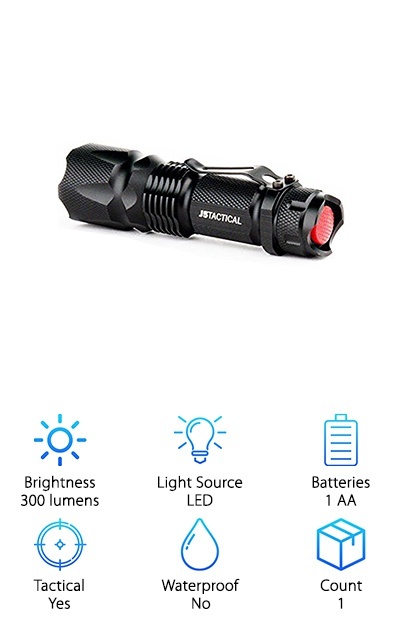 This best tactical flashlight also has 3 modes - high, low, and strobe. You can also zoom and focus the beam. It’s also great for hunting and camping. Why? Because in addition to being powerful, it’s also really tough. It’s also available in a few different colors: black, aqua, hunter orange, and dessert and forest camo. It’s the perfect size to fit in your pocket and a favorite of EMTs and police officers. Why does that matter? If people in some of the most high-pressure careers depend on this flashlight, so can you. Looking for one of the best AA LED flashlights available? Look no further. You might be wondering, what makes this one of the best? It’s the perfect compact size to carry around in your pocket as your daily use flashlight. It’s durable aluminum casing is both lightweight and able to stand up to a good amount of abuse. Why does this matter? It’s a great choice to take with you when you’re cycling, camping, or hiking. It’s even reliable enough to take on long distance treks. The 3 modes - high, low, and strobe - will all come in handy whether you’re venturing in the outdoors or if you’re carrying it around to use when you’re at work. And get this: it’s waterproof. This is a 5 pack and would make great gifts for the outdoorsmen in your life! The is, hands down, the brightest AA flashlight we found in our research. How bright is it? A whopping 1075 lumens. That’s not all. It has an impressive beam distance, too, at 1151 feet at its brightest. It gets this power from the 9 AA batteries that power it and gives you an impressive 6 hours and 15 minutes of runtime on this highest, brightest setting. That’s not all. The beam is easily adjustable so you can easily go from using this as a floodlight to a more focuses spot light. Simply use the quick-cycle switch to quickly go back and forth from high to low output. It’s a little bit larger than some of the other options, but that’s because it’s simply so powerful. Want to know the best part? It comes with a lifetime warranty. This mini flashlight packs a lot of punch into a compact little body. You get 5 in this set, perfect for gift giving or, if you want, keep one in your car, at work, in the garage, in your bedroom, and handy in the kitchen. The steel body clip also makes it really convenient to carry around if you want to. Plus, it has 3 modes: high, low, and strobe. Just flip a simple switch to alternate between modes. It’s a good choice for biking, camping, and hiking because it’s so lightweight. Another good thing? It only requires one battery. Bring a few spares one with you and it can easily get you through a weekend in the woods. There’s more. They offer a lifetime breakage replacement policy and a 100% satisfaction guarantee. 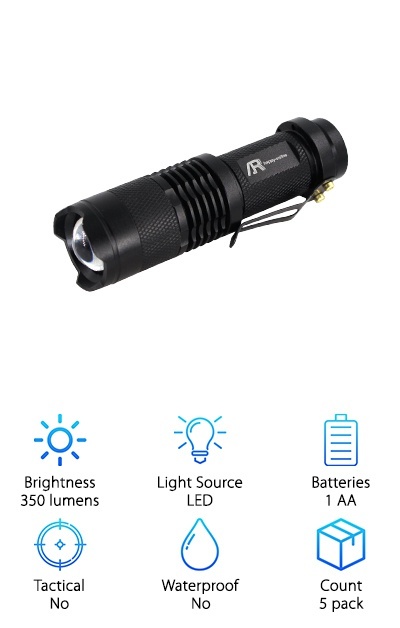 Were you just thinking about how much you needed a tiny single AA flashlight that could fit in the palm of your hand? Well, we found it for you. The Fenix Flashlights E12 is just about 3.5 inches long. An AA battery is included, too, so you’ll be ready to go as soon as you open the box. 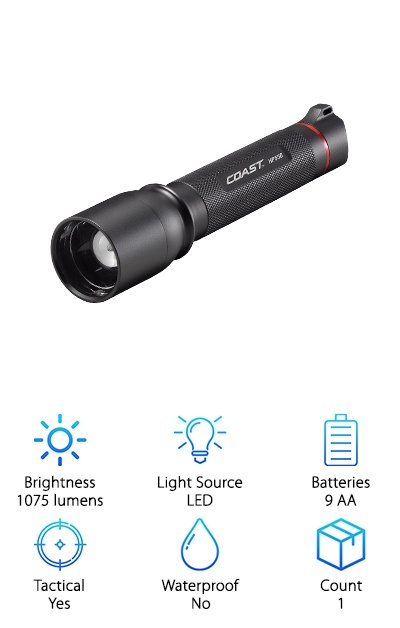 There are 3 settings on this powerful little flashlight - high, medium, and low. It’s really easy to control, just push the switch on the end to turn it off and cycle through the different modes. The switch is even recessed slightly to avoid accidentally turning it on in your pocket or bag. The case is made of an aluminum alloy, keeping it lightweight and durable, two things you need in a tactical flashlight. Oh, you also get a limited lifetime warranty. Just high quality is the ThruNite Archer 2A V3? Well, how about this. It’s made from aerospace grade aluminum and had a military grade anti-abrasive, hard-anodized finish. What does that mean? It’s tough and designed so it won’t hurt your hand with extended use. This is a great choice for someone working in a high-pressure, intense profession who needs a reliable, durable, and easy to carry light. Think police officer, security guards, EMTs. Here’s one cool thing about this one: it has 5 modes. Of course, you get the standard high, medium, and low. There’s also a strobe function for emergencies. What’s the last mode? Well, it’s called firefly mode and it’s designed to give you just a little light once your eyes have adjusted to the dark. It’s the best 2 AA flashlight. This compact and powerful tactical flashlight has 3 different profiles that you can choose from. One allows for high, low, and strobe. There’s also a setting for high only and high and low only. Everything is controlled with a tail switch so you can easily make any changes quickly using only one hand. Batteries are included, which is always night, but that’s not all you get. Included are a removable pocket clip and a nylon holster. It’s even serialized so that it will always be able to tell who it belongs to. This is a good choice for professionals looking for something lightweight, powerful, and easy to carry. That said, it will also fit right in on any camping or outdoor trip. That’s not all. It’s also waterproof for up to 1 meter for up to 30 minutes. The Energizer Metal Flashlight is one of the brightest AA flashlights available with an impressive 900 lumens. And it should be! It’s powered by 6 included Energizer Max batteries! The light has been designed to mimic the color of natural daylight so it’s not too harsh or yellow. Alternating between high, low, and strobe mode is easy with the smooth digital switch. Want to hear another cool thing it has? One-press Digital Focus easily changes the beam from full spotlight to full flood light. You actually get a lot of control over this light which makes it a good fit for just about anyone. The aluminum alloy case not only makes this a lightweight choice, it’s also very durable. This is a great one to use outdoors but it would surely do the trick indoors, too. If you’re looking for a flashlight that can take a bit more abuse, this might be just what you had in mind. For starters, is has a 190-lumens, 275-meter, 5-hour runtime. But here’s the best part: it’s made of durable plastic and rubber. How strong is it? It can tolerate a drop of up to 10-feet without sustaining any damage. That’s not all. It’s available in several bright colors: yellow, purple, neon green, neon blue, and neon pink. Choose your favorite one and it’ll be easy to find your flashlight when you’re looking for it. Of course, it also comes with a nylon lanyard so you can always have it close at hand when you need it. It’s powered by 4 AA batteries which are included as well as a 1-year limited warranty.